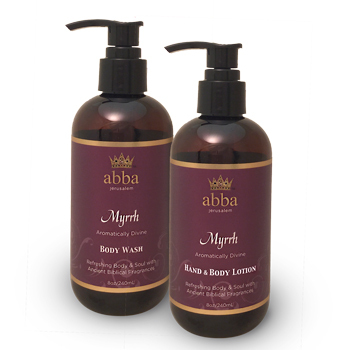 Refreshing Body and Soul with Ancient Biblical Fragrances! Myrrh, an exotic Biblical spice, was used as a burial spice but also in purification and beautification rites. The Bible records the story of Esther, one of many beautiful virgins brought to the King of Persia's palace, who was bathed in Oil of Myrrh for six months and with other aloes and perfumes for another six months before her One Night with the King (Esther 2:12). As the story continues, Esther finds great favor with King Xerxes; "The king loved Esther more than all the other women, and she obtained grace and favor in his sight more than all the virgins; so he set the royal crown upon her head and made her queen..." (Esther 2:17). Song of Sol. 1:13: "A bundle of myrrh is my well-beloved unto me." Botanically Rich & Aromatically Divine! The amazing properties of therapeutic oils have been known and used since biblical times to anoint the body for healing, ceremony and beauty. Enjoy a new shower and bath experience with this Aromatherapy Body Wash invigorating the senses with pure essential oils. This soothing wash offers Coconut's fine lather and long-lasting foam, and can be used as a shower gel, bubble bath or hand soap for gentle cleansing and care. It balances the oil production of the skin, benefiting both dry as well as oily skin, leaving it naturally beautiful and healthy. *Fragranced with proprietary formula of essential oils and plant essences. The amazing properties of therapeutic oils have been known and used since biblical times to anoint the body for healing, ceremony and beauty. This Aromatherapy lotion offers carefully selected plant-based ingredients with the luxurious feel of genuine essential oils. It spreads easily and absorbs fast, providing nourishment in abundance. A unique formulation of Jojoba, Sunflower, Aloe and Rice Bran extracts in combination with essential oils restores skin's natural balance for radiant health.